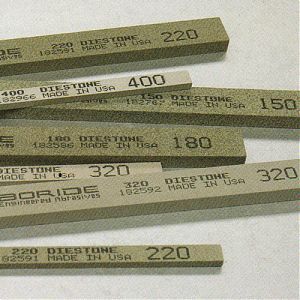 Boride Die Stone - Slightly harder than AM2, the Die stone is an excellent all around finishing stone. Boride Die Stone is engineered for hand polishing all types of tool steels. It provides consistent breakdown and fast cutting action. Some polishers obtain excellent results using water when finishing kirksite. Available in grits 180, 220, 320, 400, and 600. Boride stones must be purchased in increments of 12; priced per piece. Please select stone size and grit from drop down menu below. Stone Size 1/16" x 1/4" x 6" 1/16" x 1/2" x 6" 1/8" x 1/4" x 6" 1/8" x 1/2" x 6" 5/32" Square x 6" 1/4" Square x 6" 1/4" x 1/2" x 6" 1/4" x 1" x 6" 1/4" Round x 5.5"